[SatNews] C-COM Satellite Systems will be displaying their nexgen, one-button, auto-acquire antennas at the Satellite 2014 Show. C-COM engineers have been busy developing smaller, lighter, more robust products, built to endure the most harsh conditions. At the company's booth # 6041, you will be able to demo the Next Gen iNetVu Ka-75V, FLY-75V and 981 antennas and controllers. The iNetVu FLY-75V Flyaway Antenna is the first Ka-band auto-acquire flyaway to be authorized for use on ViaSat Exede® Enterprise Service. The driveaway version of this product, the Ka-75V, has been authorized for more than a year, and has been selling briskly throughout the U.S. and Europe. These systems can be easily configured to provide instant access to satellite communications for any application that requires reliable and/or remote connectivity in a rugged environment. This next generation mobile Ka- terminal delivers affordable broadband Internet services (high-speed access, video and voice over IP, file transfer, email or web browsing). It is ideally suited for industries such as Oil & Gas Exploration, Military Communications, Disaster Management, SNG, Emergency Communications Backup, Cellular Backhaul and many others. If you are looking for a Ku-Ka product the versatile and compact iNetVu 981 Driveaway Antenna is the ideal solution. Built either in Ku- or Ka-, the unit is upgradeable and swappable to either band. 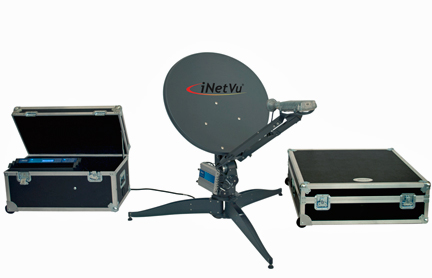 This 98cm Ku-band auto-acquire system can be mounted on the roof of a vehicle for direct broadband access over any configured satellite and works seamlessly with the iNetVu® 7024C Controller providing fast satellite acquisition within minutes, anytime anywhere. Come see for yourself and visit our booth # 6041!